If you think you’ve tasted everything there is to taste in the taco world, you’d be surprised. A trip to some of Georgia’s best taco places prove that this delectable international fare has no limits. Perfect for snacking or as the main course, your taste buds deserve to try these 10 best taco joints in Georgia. No, that’s not a typo in the name—it’s a play on the Mexican alphabet that lets you know they’re the rreal deal. Fresh corn tortillas create the base for the most delectable tacos in the state, including pork, chicken, beef, fish, and veggie varieties. Add a side of avocado and you’ve got nothing short of perfection. Don’t be fooled by their humble digs—this place is bursting with some of the best tacos in the state. They’ve brought some of the best flavors of Mexico to this charming little Georgia town. Take your pick from slow-roasted pork, beef, fish, or chicken decked out in fresh veggies, salsa, and condiments. If you have to stop for lunch on a road trip, why not stop for some of the best tacos you'll ever eat? If you’re struggling to find tacos done right, you owe it to your appetite to come here. Featuring both Mexican and “American” tacos, you can take your pick from chorizo, chicken, and beef, among others, then load them up with veggies, sour cream, and other eats for a tasty creation. With a menu this good, you’ll want to try it all. Their tacos look almost too good to eat—almost. Luckily, they taste every bit as good as they appear. Locals love them because of their authentic tacos and other fare, all priced reasonably and well portioned. With tacos this authentic, you’d think you stepped through a portal into Mexico. 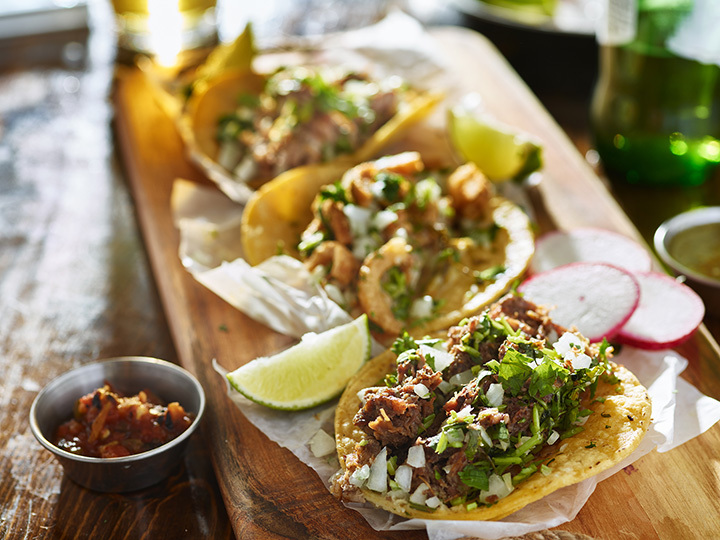 Fresh flavors comprise some of the best tacos in the state, including chorizo, fish, steak, pork, and other favorites. They pride themselves on made-from-scratch creations, and your taste buds will appreciate the difference. A modest exterior is housing one of Georgia’s best kept secrets—a delicious variety of true Mexican tacos. Every taco is made to order to give you the freshest food possible. Take your pick of crunchy or hard shell, then have it piled high with lettuce, cheese, tomatoes, cilantro, taco sauce, and either steak, shrimp, chicken, bean, or beef. Or, grab a Taco Burger for a unique experience. Their original recipes and big imaginations have made Tacos and Tequila one of the state’s biggest hotspots for tacos. They feature tacos to fit just about any diet. Fans rave about the fried avocado taco and the portobello taco, but they also feature plenty of options for carnivores, too. STREET TACO 🌮 oh yea! These tacos are heaven sent. With unique meats like goat and pork belly, their biggest fans know each meal is just like an adventure. Holy Taco uses local, sustainable ingredients in their tacos and other dishes, making them as eco-friendly as they are tasty. This laid-back Mexican eatery is well known for their delectable tacos and complementing salsa bar. Their loyal patrons love them for having the best food for the best price in town, along with an extensive menu that kind of makes it hard to pick just one. Oh yeah, they deliver, too! Fuzzy’s Taco Shop is a chain, but that just means you can expect consistency no matter which one you go to. Their tacos are packed full of fresh meats, veggies, and other flavors, making them as healthy (or not) as you like them. With fresh ingredients and bold Baja flavors, we're na-cho average taco shop. So go ahead -- meet your new addiction.